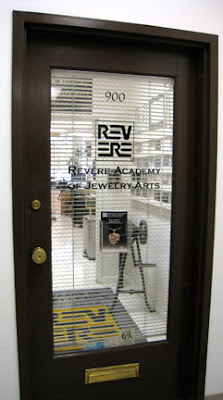 In the past year, I have had the pleasure of attending 2 classes at Revere Academy of Jewelry Arts. I left both classes trying to formulate a way to ditch all of my current responsibilities so I could move to the city, rent a studio apartment and become a full-time Revere student. Yep, it's THAT GOOD. But alas, I know my place is here at Beaducation and I'll stick with occasional weekend classes. This academy is a very special place. It was started in 1979 by master goldsmith Alan Revere. Not only do they offer great classes, the environment is incredible. 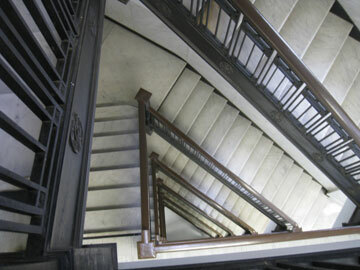 The school is in a corner suite of the 9th floor, down a long beautiful marble hallway in the historic Phelan Building on Market Street in downtown San Francisco. The instructors here are friendly, knowledgable and very clear in their instruction. I took Fabrication 1 and Fabrication 2 and left both three day classes with my notebook and brain stuffed with great information and the courage to continue these new skills at home. 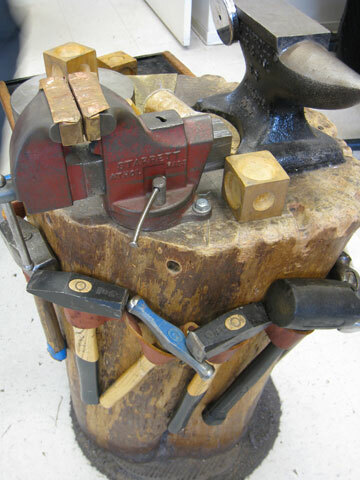 I am now fully confident in my soldering, sawing, filing, carving and forging. These two fabrication classes are perfect for the beader or wireworker ready to expand more into metalworking. "During my last year in high school I was asked over and over again, 'What do you want to do after high school?' I always answered with a very typical teenage response: 'I don't know.' It turns out I did know and once I verbalized my desire to pursue jewelry as a trade and craft my dad found Revere Academy of Jewelry Arts. I moved to San Francisco at the age of 19 to attend the Masters Program. 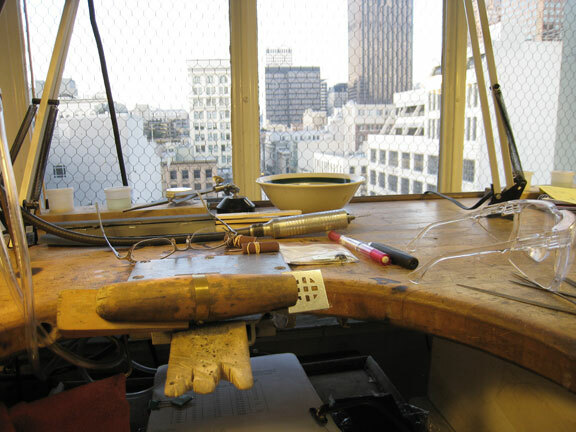 Now picture that -- a little Midwestern girl moving to the big city of San Francisco to make jewelry. FUN!" in the historic Phelan Building. Aisha continued, "The Revere instructors are currently working in the field and are not only thorough in their instruction of the techniques, but also generous with their knowledge of this sometimes overwhelming industry. I explain to people who are interested in taking classes at Revere that they teach traditional silversmithing techniques in an old world way. You will learn the long, hard way so you can later break the rules without breaking the integrity of your piece. Every minute of Fabrication 1 all the way up to Granulation was a wonderful experience. I recently went back to take a chain weaving class and felt exactly like I did 12 years ago as a young student learning from the masters -- honored." Aisha and I agree, if you are ready to expand your metalsmithing skills, this is the place to do it. Click here to see their class selection. I've actually considered flying out for a weekend class. So happy to read a personal experience. Thank you for sharing! Thank you for sharing your incredible experiences at the Revere Academy. How awesome to realize you wanted to pursue jewelry and how supportive of your Dad to find a place for you to do so.